Diamond Hotel Philippines sets the stage for an ultimate Valentine's Day celebration. Prepare your hearts for a nice surprise with the hotel's romantic deals. From gastronomic romance, cozy ambiance, soulful music and soothing entertainment to luxurious accommodations, the 5-star hotel in the Manila Bay area is no doubt an ideal destination to celebrate love and take your special someone to a romantic date. Rediscover the meaning of romance with an overnight stay in a Deluxe Room for only Php 9,500 nett per night. From February 13 to 15, the hotel’s Valentine Room Packages include breakfast for two, lunch or dinner buffet for two at Corniche, unlimited Wi-Fi access in the room for two devices, access to the Health Club and Spa and swimming pool, and a sweet treat of two glasses of Rosé wine. Room packages for the Suites and Premier floors are also available. Make your reservations at www.diamondhotel.com using the promo code: COUPLESTREAT. Reserve the most romantic table at Corniche Restaurant for a special gastronomic venture of carefully crafted cuisines created for Cupid's day. The sumptuous Valentine Lunch and Dinner buffets from February 13 to 15 are perfect for a romantic dining experience priced at Php 2,980 nett per person, inclusive of a glass of Rosé wine. An acoustic trio will surely complete your night on February 14. 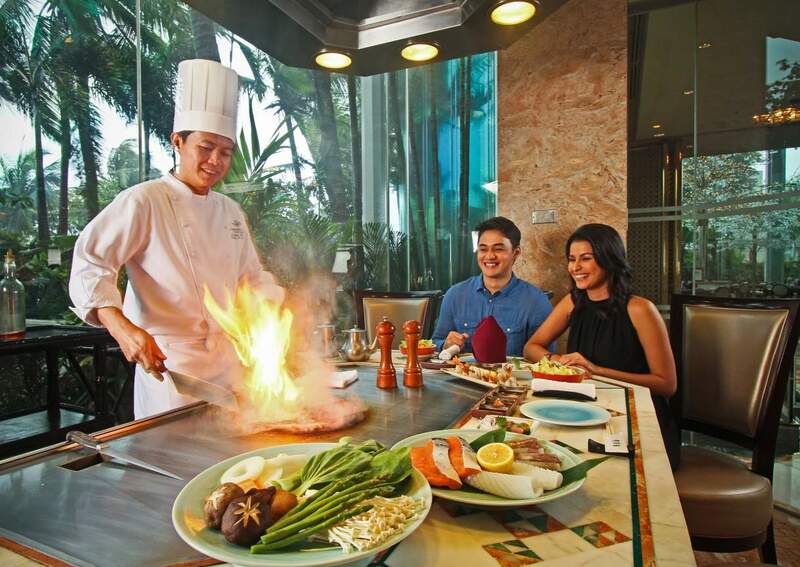 At Yurakuen Restaurant, partake in a splendid Japanese feast from February 13 to 15 with its Ai Ni Kotaeru White Day (Answer Love on White Day), a Dinner Set Menu, priced at Php 2,680 nett per person. Feel the joy of love from the harmony of a flute and guitar duo on February 14. Make the most of your Valentine at the Poolside of the hotel with a wonderful Valentine al fresco date on February 13 and 14. Dine under the stars with your loved one for only Php6,800 nett for two persons inclusive of a 4-course set dinner with a glass of Rosé wine and entertainment by a featured piano and lounge singer, Precious and Kiko. Dine at Lobby Lounge for an intimate date with your loved one over a 4-course dinner with a glass of Cava for only Php 3,200 nett for two persons and a complimentary 6-inch cake. For an extra touch of sweetness, indulge in an array of luscious cakes and melt-in-your-mouth chocolates to cap off your date night. Bar27 at the soaring 27th floor will set you high in love on February 13 and 14 with an evening of entertainment for only Php 1,800 nett consumable per person featuring a showband to serenade you with cover versions of your favorite love songs.